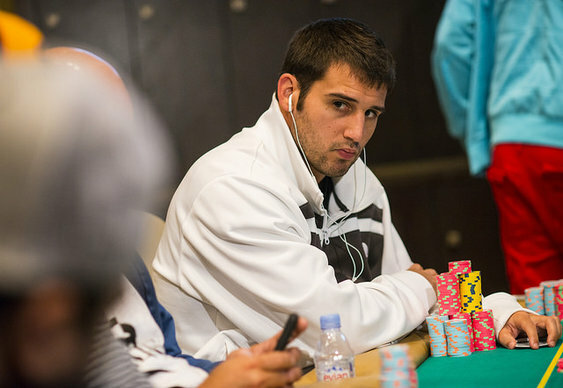 Darren Elias is the man to beat heading into today's final table at the WPT Borgata Open. The American pro finished fifth in the same event in 2011 and is well placed to go even deeper this time out. His stack of 9,890,000 gives him a decent advantage over long-time leader Blake Bohn, who'll return with 7,705,000, and Kane Kalas who sits in third with 7,165,000. There's a big gap to Aaron Overton, fourth with 3,245,000. Jose Serratos and Ray Qartomy are battling it out for short stack status with 2,390,000 and 2,340, respectively. Jean Gaspard enjoyed a huge chip lead going into the penultimate day's action but his challenged stalled on the bubble. The American took a stand with As10d and was looked up by Darren Elias and Kane Kalas. Both players checked the 10h7h6d before Kalas bet 900,000 after the Jd appeared on the turn. Both players again checked the 4s river with Kalas tabling pocket queens which was plenty good enough to beat Gaspard. Other notables to make the money yesterday were Barry Shulman (18th), Erik Cajelais (16th) and former champ Bobby Oboodi (12th). Londoner Iaron Lightbourne started the day as one of the short stacks but managed to ladder his way up to 15th place and a $31,395 score. The final six are guaranteed at least $174,637 with the eventual winner pocketing $843,744.